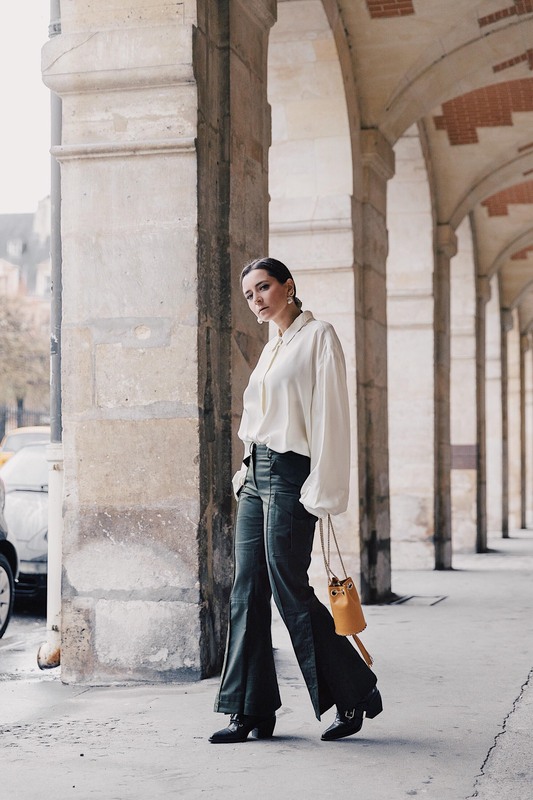 Cargo pants are on the rise and I have partnered with Farfetch, the high-end online shopping site to style these trousers for a business meeting. See the full article on this link and my interview with Joseph Furness from Farfetch below. Joseph for Farfetch: Why have you chosen these cargo pants for a business meeting? Julia: For a business meeting, I like to wear powerful and unisex pieces such as suits or cargo pants. I love these ones in particular as they give a modern boyish vibe to my outfit. I love them so much that they’ve now become a staple in my wardrobe. Farfetch: Who designed the cargo pants? Julia: My cargo trousers are from the emerging luxury label Rokh (LVMH Prize finalist that champion discreet-chic silhouettes). 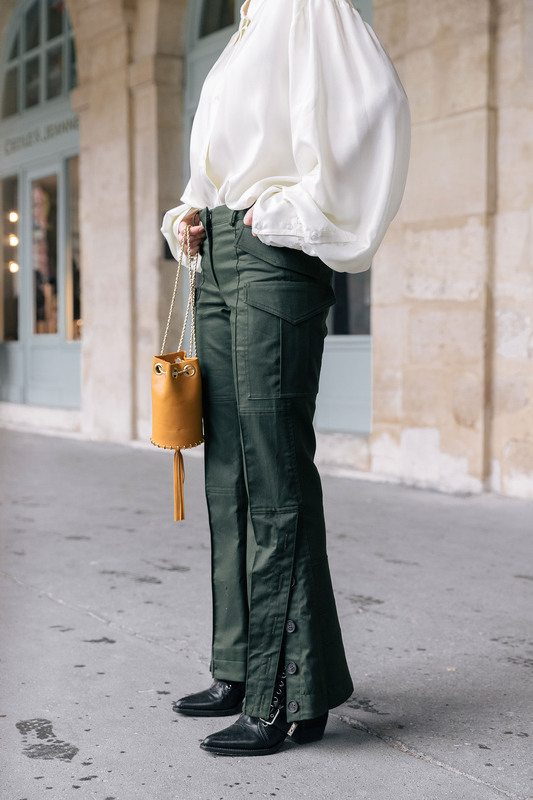 I love the flared cropped cut as it allows me to pair the pants with different types of shoes: ankle boots, heels, sneakers, etc. Farfetch: What have you styled your cargo pants with? Julia: I have styled these cargo pants with elevated pieces: pearl earrings from Chloé and an oversized yellow pastel silk blouse. I think an oversized blazer could also be a perfect addition to this look. 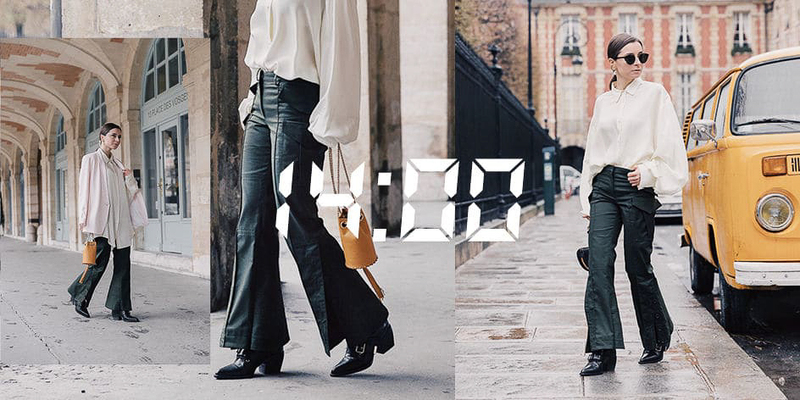 I have also been wearing these pants with my Chloé boots as I walk a lot when I am in Paris. But when I return to Los Angeles (where I mostly use my car) I will be styling these with heels. 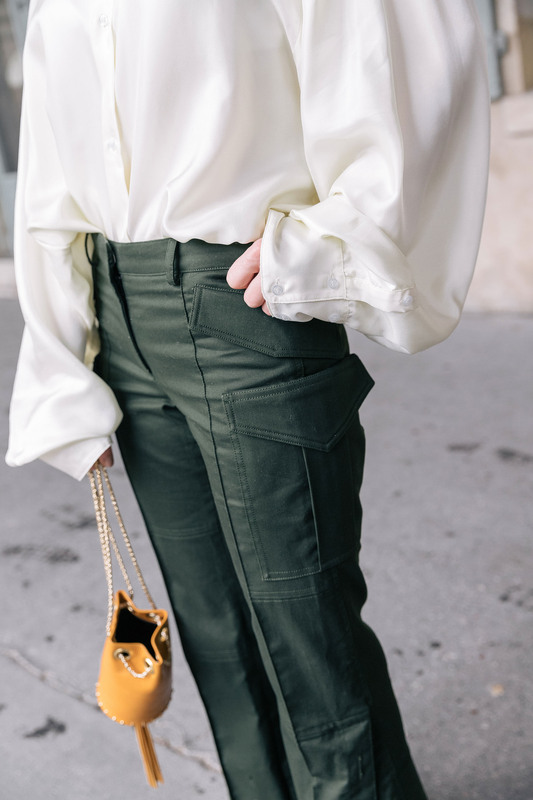 Farfetch: Why are cargo pants an essential addition to a woman’s wardrobe in 2019? Julia: In 2019, being chic is wearing versatile, elevated pieces. 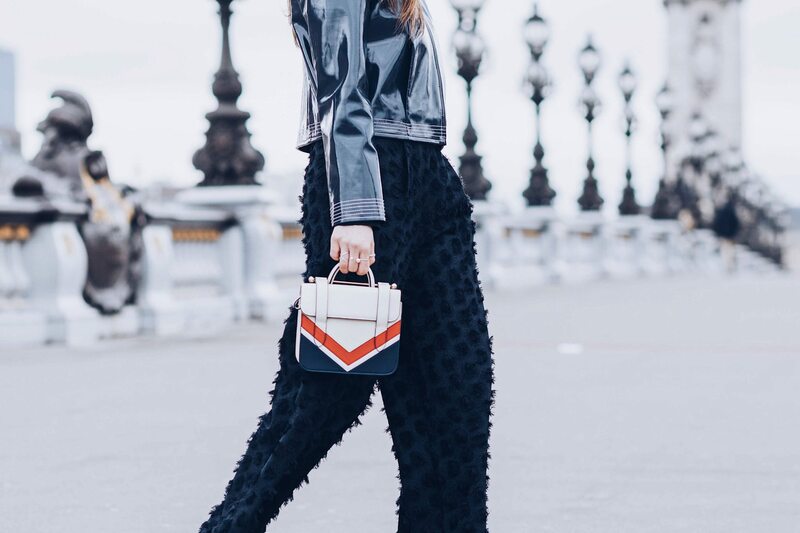 Plus this year, pants other than denim or leggings are definitely on the rise. Cargo pants are great as they are easy to mix and match with your office wardrobe. They certainly make a change from the classic workwear. Also, these pants can be worn on weekends with a cool sweater and sneakers. Farfetch: Tell us more about your career and work wear style. Julia: I am a content creator, fashion editor, and digital consultant for fashion and beauty brands. My style is effortless chic with an edgy twist. I live in Los Angeles but travel a lot to Paris and New York. As I am always on the go ― between meetings, photo shoots, and events ― I need to wear chic and versatile pieces throughout the day. Find out how to style your cargo pants for a date night or a brunch on Farfetch. See the article here. 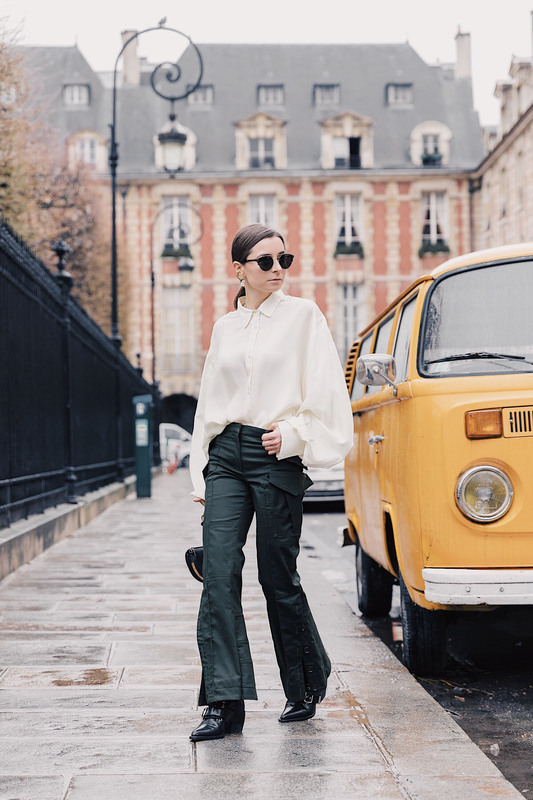 Pants Rokh via Farfetch, sunglasses: Culter & Cross, Blouse: Demain Officiel, Bag: Delafon Paris. Pictures by Sebastian Erras. Creative director and model: Julia Comil. I am living for this pants! You are working this outfit girl. You are a style inspiration. I am loving these cargo pants. The color and the flare are on point! Love how you made these look cool! They are definitely unique! Those pants are so unique! I don’t think I’d ever be able to pull off something like that, but you ROCK it! Adore this whole outfit! Great shots! I’ve never seen cargo pants look so chic! You are totally rockin these cargo pants! Love how you styled it and love it paired with this blouse! I wouldn’t have thought those were cargo pants! I am loving how you styled them and the blouse! These cargo pants are so chic! I love how you styled them. Those pants are SO chic! I didn’t realize they were cargo trousers but I like that they’re kind of a modern take on the cargo pants of old! I would never have thought of cargo pants for a biz meeting but you are rocking this look! It looks sooooo good! i’m in love with the various textures in this outfit – so pretty on you! Amazing pants. You would feel so confident going into a business meeting wearing them. What a fun and unique style of outfit! You’re rocking this look! I had no idea cargo pants were making a comeback.